The witch hazel is an unusual deciduous shrub or small tree. Although not closely related to the true hazels, there are some superficial similarities, including the leaf shape. It earns a place in the garden because of its winter interest. The clusters of flowers appear on the bare, characteristically zigzagging, grey branches from January to March, with the exception of Hamamelis virginiana, which flowers from September to November. Depending on type, the frost-resistant flowers can be yellow, orange or red. They have narrow, 1cm to 2cm long, spidery petals and a pleasant, slightly spicy, sweet scent. Witch hazels also have excellent autumn colour, and the plant brings ornament to the garden through all four seasons. The genus name, Hamamelis, means ‘together with fruit’. This is a reference to the production of new flowers while the previous year’s seeds are still maturing on the plant. The fruit is a 1cm long bright green capsule that contains two small, glossy-black seeds. These take some 8 to 10 months to ripen, by which time the case has turned brown and appears woody. At maturity, the capsule splits in half with a loud and sudden ‘pop’, ejecting the seeds for distances of up to 10m from the parent plant. The name ‘witch’ is thought to derive from the Middle English ‘wiche’, meaning bendable, and the plant was also believed to have magical qualities. The twigs were traditionally used as water divining rods. The first witch hazel to find a place in British gardens was the American Hamamelis virginiana, but varieties derived from the Chinese species Hamamelis mollis are now more popular, primarily due to its larger and brighter yellow winter flowers. 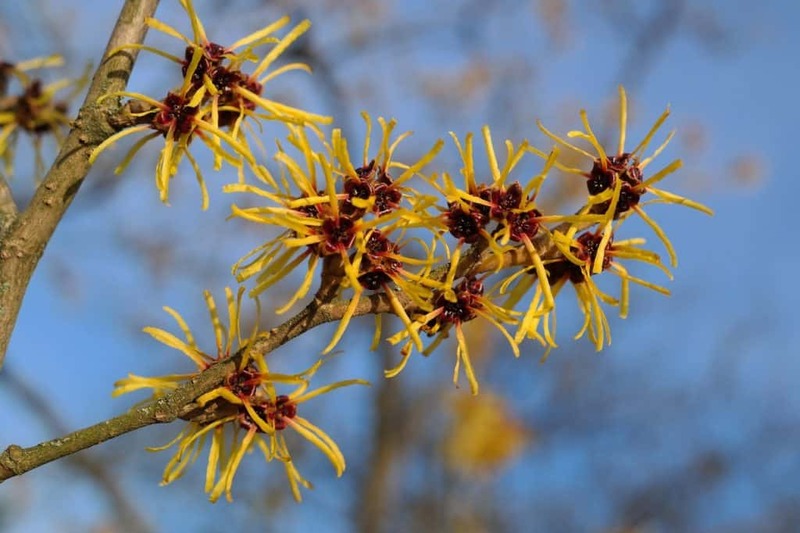 Several witch hazel species are available for garden planting, though cultivars selected for flower colour are generally more popular and widely available from garden centres. The species used in gardens and commercial landscape plantings include Hamamelis japonica, H. Mexicana, H. mollis, H. ovalis, H. vernalis and H. virginiana. Many of the cultivars are derived from H. × intermedia (a hybrid between H. japonica and H. mollis). The American or Virginian witch hazel has clusters of scented yellow flowers in the autumn. It is slow growing, but forms a handsome shrub that will eventually achieve 4m to 5m in height. It has attractive yellow autumn colours. It can be grown as an upright shrub, a small tree, or coppiced as a multi-stemmed shrub. It can also be used for hedging. This red-flowered witch hazel has a long flowering period and is pleasantly, if faintly, scented. It has a spreading form and grows slowly over 20 years or so to become 3m tall. The flowers are a deep purplish-red, while the large, matt green leaves turn shades of red, orange and yellow in autumn. It has been given the RHS Award of Garden Merit. Another RHS Award of Garden Merit winner, ‘Vesna’ has dangling clusters of strongly scented, deep orange-yellow flowers that are red at the base. It has particularly good autumn colours. It will grow up to 4m in height, and it provides year-round interest in a small garden. ‘Jelena’ is widely regarded as one of the best witch hazel cultivars. It produces an abundance of coppery-orange flowers with a very faint lemony smell in January and February, and has striking red and orange autumn leaf colours. It grows to 4m tall, and will tolerate some exposure. It has the RHS Award of Garden Merit. Probably the best yellow witch hazel cultivar, ‘Pallida’ is a very traditional shrub in many cottage gardens. It has fragrant sulphur-yellow flowers and rich yellow and orange autumn foliage colours. It grows to 3.5m in height. It is another recipient of the RHS Award of Garden Merit. The flowers of ‘Orange Beauty’ change from an orange-yellow in early winter to a deeper amber-red in the New Year. The flowers are sweetly scented. It is a shorter variety at up to 3m tall. ‘Firecracker’ produces an abundance of attractive flowers that start a deep red colour before becoming more orangey. The foliage turns an equally attractive shade of orange and red in the autumn. Another RHS Award of Garden Merit winner, ‘Arnold Promise’ has vibrant, buttercup-yellow, heavily scented flowers in January and February. It has a denser growth form than most other witch hazel varieties. This cultivar of H. mollis also has an RHS Award of Garden Merit, and is named after the RHS garden in Surrey. It has a vigorous, upright habit, and will grow up to 3m and bushes out with age. The large, bright yellow flowers are sweetly fragranced. Witch hazel is an easy shrub to care for and it requires little maintenance once established. Container-grown plants can be planted out at any time, though they will do best if bought and planted out in the autumn. To reduce the potential for suckering from the rootstock, avoid planting a container-grown shrub too deeply and never bury the graft union, which should be identifiable as a bulbous piece of stem just above compost level. While fully hardy once established, with an ability to flower on through ice and frost, young witch hazel shrubs can be damaged by hard frosts when first planted out, and they will benefit from protection with a few layers of fleece in the first couple of winters if hard winter or spring frosts are anticipated. A mulch with organic matter such as garden compost in late winter or early spring will provide further protection, keep down competing weeds, and help to retain soil moisture. Witch hazels do best in an open, sunny position, and they can become untidy and dishevelled in shade, although they will tolerate some light shade. In general, they flower most abundantly in positions where they receive full sun for most of the day. Witch hazel plants benefit from being watered during dry periods throughout the year, particularly when they are young and still establishing. Flowering may be aborted or the blooms dropped if the plant suffers from a water shortage. Mulching in winter or early spring will help to conserve water at the most critical times. Witch hazels require free-draining soils with good moisture retention qualities. They do best in light soils with plenty of added organic matter, such as well-rotted manure or garden compost. They will manage in a heavy clay soil provided it has been improved by digging in organic matter and horticultural grit. An acidic to neutral soil between pH 4.5 and 6.5 is preferred, and witch hazel is unlikely to tolerate chalky, alkaline conditions. Witch hazels do not need much feeding, but they may benefit from a top dressing of a general balanced fertiliser such as fish, blood and bone in late winter or early spring. This should be added to the soil before the annual mulch. 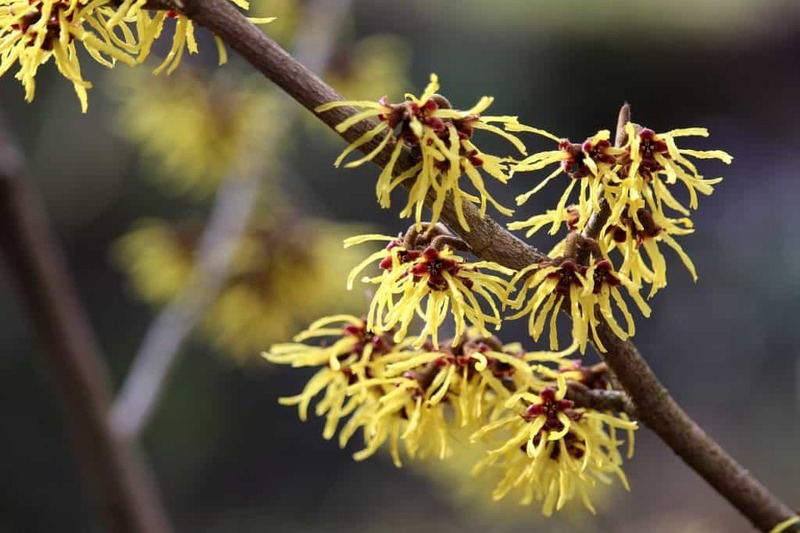 While witch hazel shrubs will grow in large containers, they will develop more slowly than those planted in open ground, and may only put on 15cm or so per year. This may be the only method of growing them in gardens with chalky soils. Use an ericaceous potting compost such as John Innes ericaceous, and pot on to gradually larger pots as the shrub grows, with the aim of planting into a large, permanent container about 40cm in depth and diameter as a minimum. The pot needs good drainage holes and a layer of broken crocks, and it should stand on pot feet to ensure that the drainage holes are not impeded. The compost should never be allowed to dry out, and the plant will need to be well watered in warm weather to cool the roots around the edge of the pot. Witch hazel adds interest to any woodland garden, mixed shrub border, or it can be used as a hedge. However, to see it at its best it should be part of a winter garden or border, where its architectural branching and winter flowers can be enjoyed to the full. Winter gardens traditionally include a seat adjacent to the witch hazels so that the scent of the flowers can be enjoyed on a sunny winter’s day. The winter shrubbery can also include Skimmia, Mahonia x media ‘Winter Sun’, a red-barked dogwood like ‘midwinter fire’, red-stemmed willows such as Salix alba vitellina ‘Britzensis’, or a specimen wintersweet such as Chimonanthus praecox ‘Luteus’. Under-plant the shrubs with winter aconite, bluebell, snowdrop, hellebores and early narcissi such as ‘Cedric Morris’ for added ground level colour and to extend the winter garden interest into early spring. Where there is room for a small tree, include a deciduous specimen with attractive winter bark texture and colour, for example the maple Acer griseum or a birch like ‘Grayswood ghost’. Other than the occasional removal of any damaged branches back to healthy wood, witch hazels are relatively maintenance free, and will not require regular pruning. Specimen shrubs can sometimes be improved by the removal of congested, crossing or weak shoots, but this risks detracting from its characteristic winter architectural profile of zigzag stems. Most nursery-supplied witch hazels are grafted onto a rootstock, so any suckers emerging at or below the soil line should be removed from the shrub in autumn. If a plant really has to be kept in check to avoid it out-growing its space, the previous season’s growth can be cut back to two leaf buds just after it has flowered in early spring to maintain its shape and size. The leaf buds are longer and narrower than the flower buds. Young plants can be fan-trained by tying the strongest branches to horizontal wires secured to a supporting wall, fence or trellis, and removing any other basal growth. In subsequent years, leave the selected shoots to extend the framework, and cut out any strong side shoots and any other unwanted branches to two leaf buds after flowering. Witch hazel propagation can be difficult, and some horticultural expertise and experience is required. Commercially produced witch hazel cultivars are generally grafted or budded onto Hamamelis virginiana rootstocks. Cuttings are therefore unlikely to match the parent plant. Witch hazel cuttings are not easy to root or keep alive. Softwood cuttings should be taken in mid-spring. These should be plunged immediately around the edge of a pot of very free-draining cutting mixture comprising 40% multipurpose compost, 30% perlite and 30% composted bark. Cover the pot with a clear plastic bag supported on canes or a wire loop to maintain the humidity around the cuttings. The cuttings will require a steady bottom heat of 20ºC. If successful, rooting should happen with two months. The young plants should not be disturbed during the year, but left in the cutting pot. They can be potted on into a multipurpose compost in individual pots on their first birthday. Spring layering can also be used produce young plants, but again the success rate may be low, so a number of attempts may be necessary. To layer, bend a healthy, growing stem down to the soil or to the surface of a compost-filled container, having first made a short incision on the underside of the stem where it will touch the soil. Bury it slightly in a trench, anchor the stem using wire loops and then refill with soil to cover it. Once roots have developed, sever the new plant from the parent with a sharp, sterilised knife and treat like an establishing cutting. Witch hazel seed is very difficult to germinate, and will take several years and a lot of patience to establish a new plant that can be put out in the garden. It is easier to use fresh seed collected from the plant, but timing can be difficult as seed taken too early will not be viable, and if left on the plant it will be lost when the seed capsule explodes. Some gardeners use contraptions made from pegs, paper bags and sticky tape to catch the seed as the pod bursts. Bought or stored seed has a deep dormancy and it will need to be cold and warm stratified before it will germinate. To hasten this, put the seeds in moistened sand in a plastic bag and put this first into a warm place at 20ºC for April and May, making sure the sand does not dry out. Then move the bag to the fridge for a further four months, keeping it moist, and then sow the seed in late summer. Occasionally, a few of the seeds may actually germinate in the sand in the course of this process, so the bag should be inspected frequently and any germinating seed removed to be potted. Sow fresh or stratified witch hazel seeds in the autumn in a well-drained seed compost with 50% perlite, cover with a very thin layer of compost or perlite, and keep the pots outdoors in a sheltered, bright spot, but not in full sunlight. Keep the compost moist. The following spring, move the pot to a cold frame or place them against a south-facing wall. Through the spring and summer, allow the top centimetre of compost to dry out before re-watering. If there is no sign of germination, repeat the process for the second winter and spring. If there is still no germination in the second year, it is unlikely that it will be successful. Move the seedlings to a sheltered and shady area and gradually introduce them to sunlight over the course of the first summer, always keeping the compost moist. Well-established seedlings can be planted out into the garden in the following spring, but most will benefit from a second year of care in the pot before planting out. Witch hazels are generally quite resilient plants and suffer few problems. Rabbits and deer browsing may be a problem in rural areas, so a guard or netting may be necessary until the plant is established and growing out of reach. As with many container-grown plants, vine weevil larvae can cause serious problems, so if possible the plant should be gently knocked out of the pot to check for root damage before purchase. The most serious and frequent diseases suffered by witch hazels are root-damaging fungi such as Phytophthora root rot and honey fungus. Powdery mildew may occasionally infect the leaves, but the damage is seldom serious or lasting and can be avoided by appropriate watering. Q Is the witch hazel in my garden the same plant that is in the tea tree and witch hazel skincare products that I buy from the chemist? Witch hazel has a long history of use in traditional medicine and herbalism for skin conditions. Native Americans used preparations of witch hazel for medicinal purposes. Extracts from the sap and bark have astringent and soothing qualities and can help to reduce swelling and bruising. Even today, pharmacies stock a wide range of waters, lotions, creams and salves that contain witch hazel extracts. Many of these claim relieving effects for sores, insect bites, burns, blisters and bruises, and for skin conditions such as psoriasis, haemorrhoids, eczema and rashes.